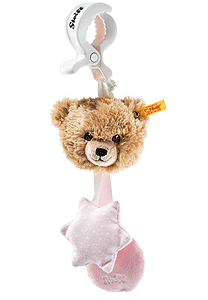 Steiff Sleep Well Bear Pram Toy with Rattle is hand made in the finest beige and pink cuddly soft plush. The sleep well bear pram toy made of soft plush fabric in gentle colours is designed for delicate baby skin. The star and circle are soft pink with white dots. There is a rattle in the star and a squeaker is built into the circle with embroidered Steiff logo. The Steiff logo appears on the clamp for fastening to the pram, baby bed or playpen. A cute, brown bear head with an embroidered brown nose and eyes and an embroidered mouth capture the attention of your baby.